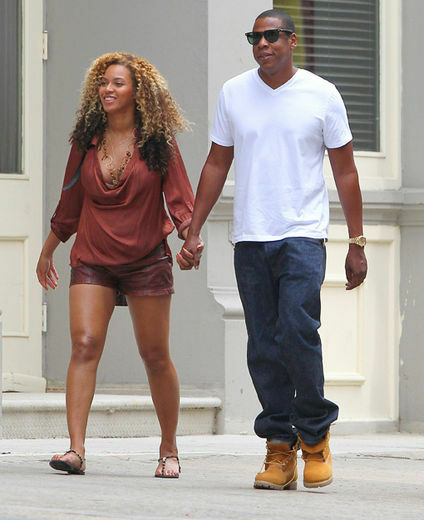 Bey and her Hubby Jayz were spotted walking down the street of there Tibeca neighborhood yesterday. I have to say I'm glad Bey has decided to go for a more relaxed comfy pregnancy experience. As you all may know some blogs are dead set on reporting that Bey is faking her pregnancy, but I really don't agree with them, first off if she is that's not any of their biz and secondly why would she that is sooo retarded for someone to really make that a legit issue, due to the fact that her bump comes and goes, well I'm pregos my self and I can assure anyone that baby bumps come and go sometimes. Anyway to Bey I say enjoy your moment and don't listen to broke a** haters that are envious of you and yours. Awh look at Mommy Alicia, juggling her son and her step son while rocking those fierce heels, not mad at you hun.